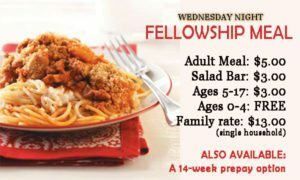 Our Wednesday Night Meals provide a wonderful time for fellowship and sharing. 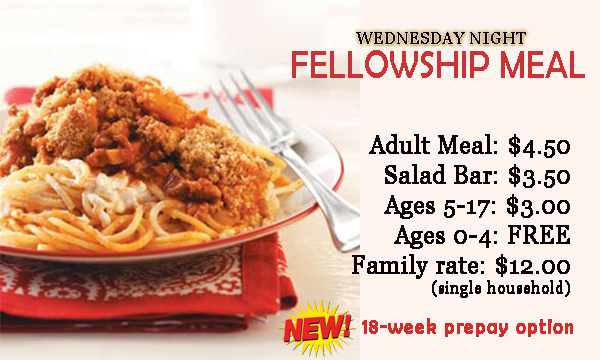 We hope you will plan to join us each Wednesday. Please have your payment ready prior to arrival if at all possible. This will allow you to pay and go through the food line as quickly as possible. We offer the option of prepaying your meals. You may either prepay by sending a check to the office marked for “Wednesday Prepay” or turn it in on Wednesday night.